The Healing Code by Dr. Alex Lloyd with Dr. Ben Johnson helps to instruct individuals on how to heal one's self on a cellular memory level. 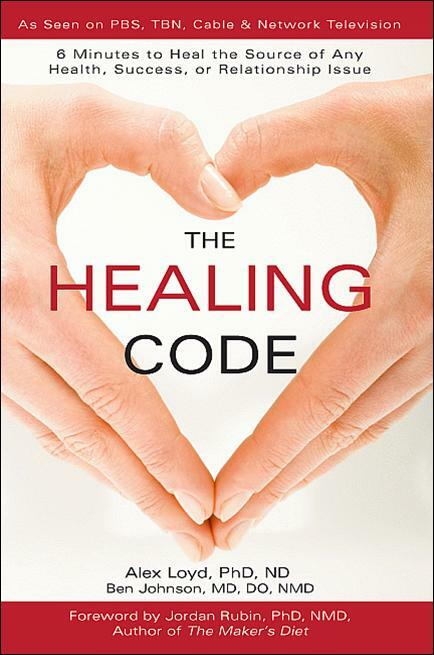 Both doctor's share their experiences, experiments and hypothesis on using the healing codes to aid and repair the issues inside of ourselves that we are unable to comprehend. They show the reader in an easy to understand format when dealing with the subjects of cellular memories, psychology, philosophy and spirituality. Dr. Lloyd's wife, Tracey, now Hope, was a severe manic depressive whose life was crumbling around her. After pouring much time, effort and money into her treatment, Dr. Lloyd has an epiphany while on an airplane, after talking to his distraught wife on the phone. He comes to realize that in order to heal our bodies we need to look at ourselves in a different perspective. We need to look at the things that have affected us in our lives, that have been now buried in our sub-conscious, being protected from us by our hearts. Dr. Lloyd states that our suppressed memories are the things that lay at the root of everything, from emotional to physical to spiritual states of ourselves, and in order to heal ourselves, we need to heal those memories. Dr. Lloyd along with Dr. Johnson show you how to heal yourself by using light energy to project loving, healing thoughts into the areas of your life that leave you feeling stressed. The hypothesis is, you take a negative feeling or situation and rate it on a scale of 1 to 10. You place that picture in your mind and while positioning your hands to certain key points and imagining loving light filtering through your fingers into these centers and projecting loving and caring thoughts, emotions and memories, you will be able to heal the source of all the things that are bothering you. There are testimonies from people, all over the world, who have claimed miraculous healing while using these codes. Some people have insisted that they received instantaneous results, while others say that it could take longer, depending on the issue you are dealing with. I, myself, have been using them for almost a week. I don't know if I see any difference in myself but I am willing to give it a bit longer. I suggest keeping a journal before you start the codes and take all the issues in your life, be honest with yourself, and rate it on a scale of 1 to 10. Then bring it out every few weeks and compare those same feelings with your present state and see if anything has changed. I found The Healing Codes to be an interesting read and learned a few things about cellular memories and how they impact our lives. 6 minutes to Heal the Source of Your Health, Success, or Relationship Issue. That’s a pretty amazing promise. The Healing Code is the result of Dr. Alexander Loyd’s search to help cure his wife’s depression.